There is a strong chill in the air as the seasons get ready to fully transition to winter, and we want to make sure that you and your home are completely prepared for the colder months ahead. At First Cut General Contractors in Durango, Colorado, we thrive on making your dreams become reality through new construction or remodel projects, and we want to ensure you get the most from those experiences. We also specialize in the installation of unique snow melt systems, so we know how important snow removal and management is to the integrity of your building. Which is why we have assembled a master to do list for you to prepare for this winter, for the inside and outside of your home. Grab your gloves and a thermos of hot coffee, and get ready to master your winter preparation! If you have a sprinkler system or irrigation setup, make sure to completely drain all of the units. Also check any outdoor faucets to make sure that they are turned off, and roll up all garden hoses for storage in a dry location. Using a ladder, take a minute to assess the condition of your roof. If you’ve got a shingle roof, keep an eye out for any missing, broken or torn shingles and replace them before the first snowfall to prevent leaks into the house. Clean off any materials that are sitting on your roof that might be holding moisture (ie: leaves, branches, debris). Clean your gutters thoroughly. If you do not clean them, any built up debris will cause water to back up and eventually cause damage to the roof, siding, or wood trim. Add extensions to the downspouts on your gutters to effectively divert water at least 3-4 feet away from the foundation. If you do not have proper downspouts in place, the water will sit against the foundation and wear it down over time. Do an inventory of your winter tools and supplies and stock up! 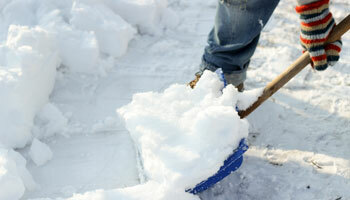 There is nothing worse than trying to move snow with an inefficient shovel, so make sure you have a heavy duty one. Also, make sure you have plenty of salt, ice melt, and at least a couple of ice scrapers for your vehicles. If you’ve got fans in your home, don’t forget to reverse them for winter! The blades should be running in a clockwise direction in order to produce the proper updraft while pushing down the warm air that has risen to the ceiling. Take a look at areas that might need caulking, such as windows and door frames. If you notice the gap is larger than the width of a nickel, then you will need to apply caulk. For exterior use, experts suggest silicone caulk because it does not shrink and is very resistant to the elements. 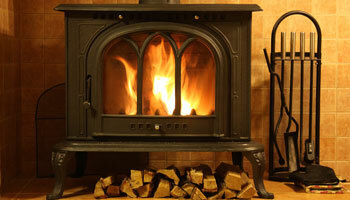 Properly prepare your fireplace or woodstove by having your chimney cleaned. Cleaning the flume at least once a year helps your fires burn more efficiently and helps prevent fires within the chimney itself. If you’ve got summer blinds that are thin and non insulated, consider investing in blinds that are going to be more insulated for the winter. If you have a furnace, thoroughly vacuum and clean out the vents as well as the filter. Don’t be shy with the caulking and weather stripping with all areas of the house, including rooms such as the basement. Caulk or weatherstrip areas where vents or pipes travel through an exterior wall to limit cold air drafts. The winter months can be very enjoyable, especially if you have a cozy and comfortable place to come home to. Adopting these routines into your winter preparation will help put your mind at ease as you watch the snowflakes gently falling. And don’t forget to count on First Cut General Contractors in Durango, Colorado for all of your snow removal and snow melting needs. We are happy to work with you to create a personalized snow melting system for your home, and we also offer full snow removal services. Sit back and relax, and let us handle the heavy shoveling!